Paint the inside of the cardboard box blue and leave to dry. Meanwhile draw or print out some fish onto the white card and colour in. Remember that coral reef fish are very bright and colourful! 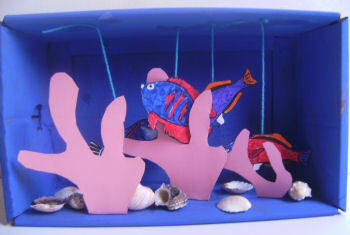 Cut some short lengths of wool and tape one end to the back of each fish and the other end to the top of the box. To make the coral, cut some tree like shapes from pink card. see the photo above for guidance on the shapes. Fold over the bottom to create a stand-up base and glue to the bottom of the box. If you have any seashells use these to decorate the bottom of your box. This wooden spoon shark craft is original and very effective - it's sure to be a huge hit with the kids!